Previous clients, Paul and Shelly sold their condo and bought a house with a panoramic view of Puget Sound in West Seattle. They loved their condo but craved more space and no shared walls with their neighbors. Their new home needed some upgrading before they could call it home. 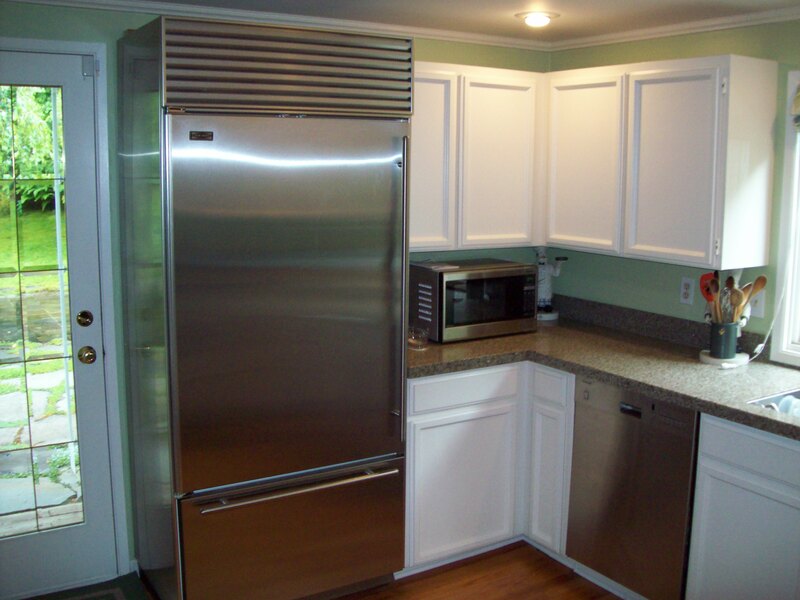 The kitchen was once again full of white cabinetry and closed off from the rest of the house, just like their Kirkland condo. 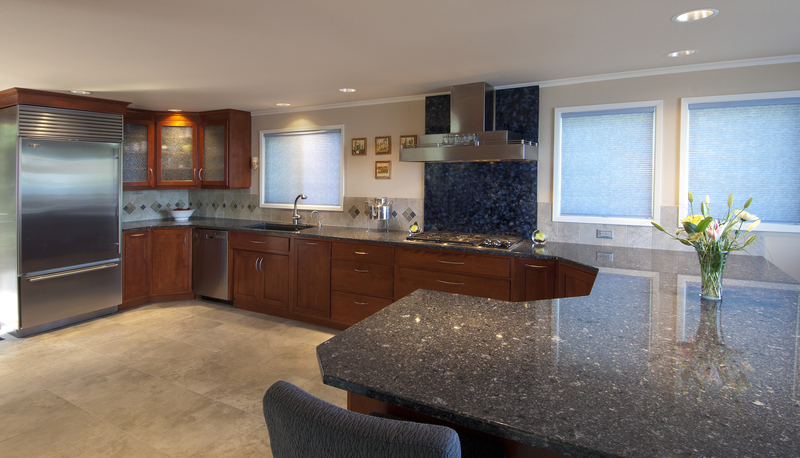 Shelly, the cook in the family, wanted to be able to enjoy the view while preparing dinner and preferred a more cohesive design with the rest of the home. 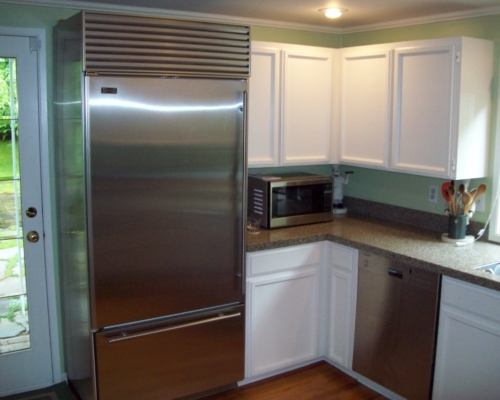 She also did not favor white cabinetry and wanted to bring in a warmer feel to the kitchen. 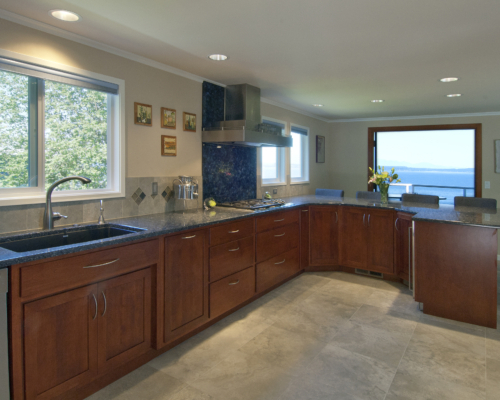 The kitchen renovation entailed removing a structural wall which we replaced with a structural beam allowing them to capture their amazing Puget Sound view. Sound. 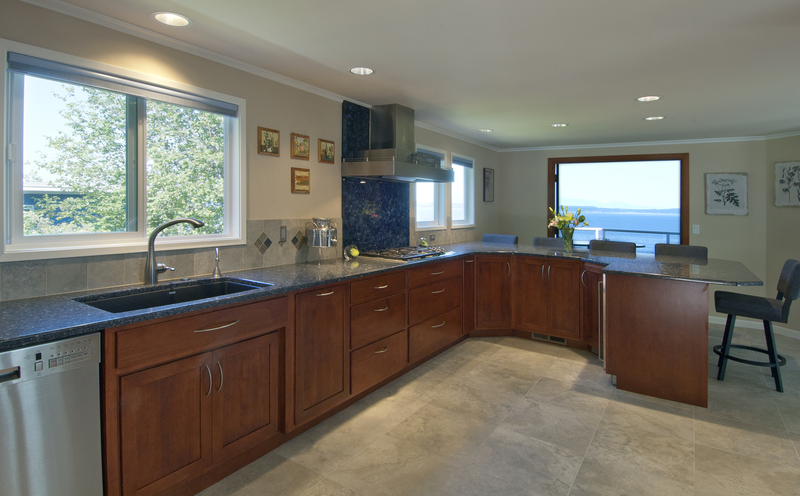 Previously a separate kitchen and dining space, the design incorporated a significant peninsula with several dining spaces at the bar. 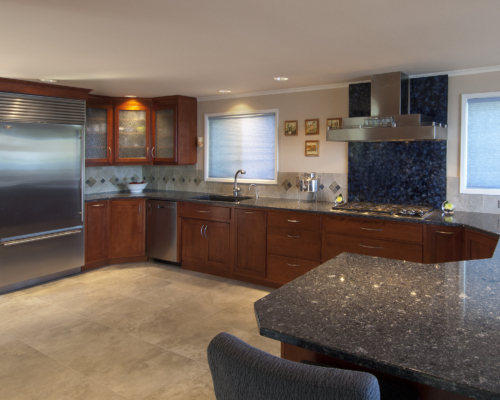 The squeaky wood floor in the kitchen was replaced with beautiful ceramic tile providing distinct definition between the kitchen and living space. 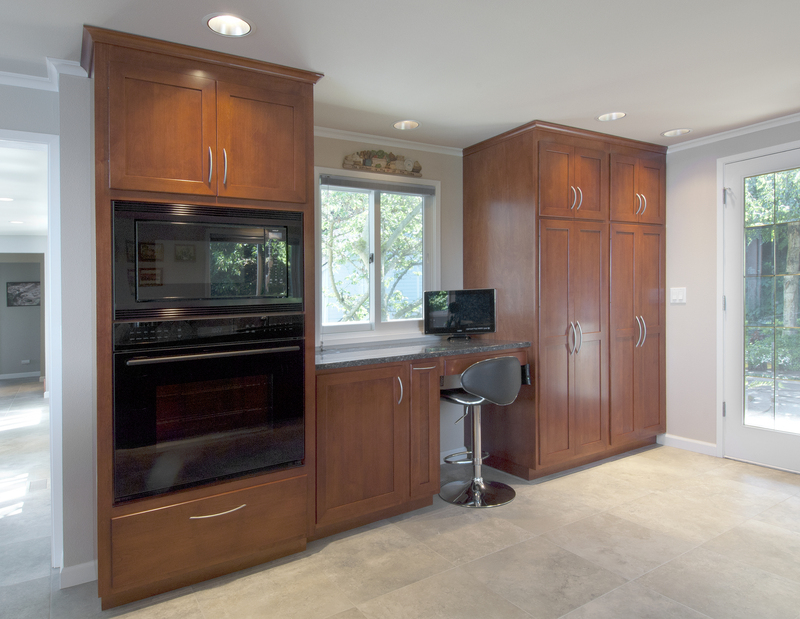 Shelly waved goodbye to the white cupboards and happily replaced them with striking cherry cabinetry and quartz countertops. 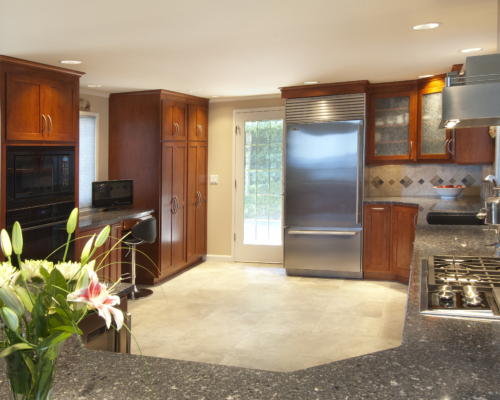 A wine refrigerator, enclosed garbage can, insta-hot faucet and large stainless steel hood can be found tastefully implemented in the space. 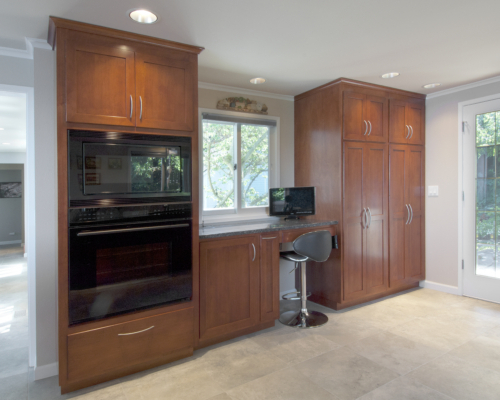 In the effort to preserve the view, minimal upper cabinets were used in this kitchen renovation. 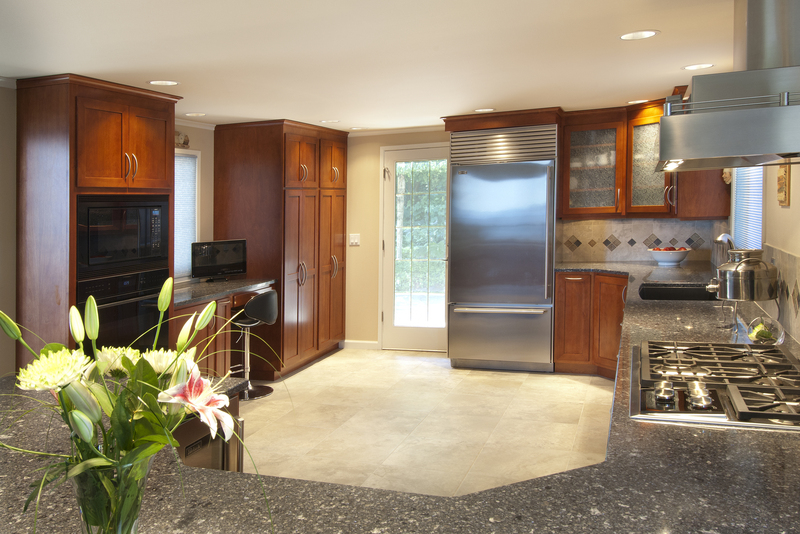 Paul and Shelly appreciate innovative design and quality craftsmanship, both things that McAdams Remodeling & Design continually provide to our clients. Most importantly, Shelly can now start dinner while appreciating the sunset over the Puget Sound!